I like to use hands-on activities for kids to practice Spanish syllables. I recently made this wheel and wanted to share the idea, the printable and a few ways to use it. Knowing how to pronounce Spanish syllables is a basic reading skill. Activities with Spanish syllables are also a useful way to practice vocabulary if you pairs the words with pictures or actions. These printable wheels with brads in the center are easy to make and make practicing syllables and vocabulary fun. Manipulating letters, syllables, pictures or objects enhances language learning. As kids color the sections of the wheel, they have to focus on the two parts of the word and the meaning. Wheels with Spanish syllables can be adapted to different levels. See the suggestions below. You can use them to support different skills. You can make them for different vocabulary. Wheels with Spanish syllables are high interest. Kids like to put things together and spin them. Parents appreciate this activity. Kids are eager to share it and parents can learn words too. I made two versions of this wheel. Coloring the wheel is a valuable language activity, but sometimes we are pressed for time. One version has the syllables in color. Kids can add more color, or they can use the wheel the way it is by matching the color of the syllables. Make the hole in the center for kids. You don’t want them to poke themselves. Give kids a list of words if they are going to color the sections of the wheel. This is especially important if they know some of the other words that could be formed. For example, you can make boca, but there is no picture of a mouth. You can make gata and match the picture, but then there is no ta for bota. Color all wheels or two of three, depending on how you want to use it. If kids color all three wheels, it is completely self-correcting. If they color two of three, they have to provide one piece (first syllable, second syllable or picture) independently. Start with only the large wheel with pictures and say the words around the wheel. Do it again clapping the syllables. Pronounce the syllables on each wheel. Say a word for kids to make and match to the picture. Show a picture for kids to make the word. Kids choose a picture from the wheel, or drawing a card, and everyone makes that word. 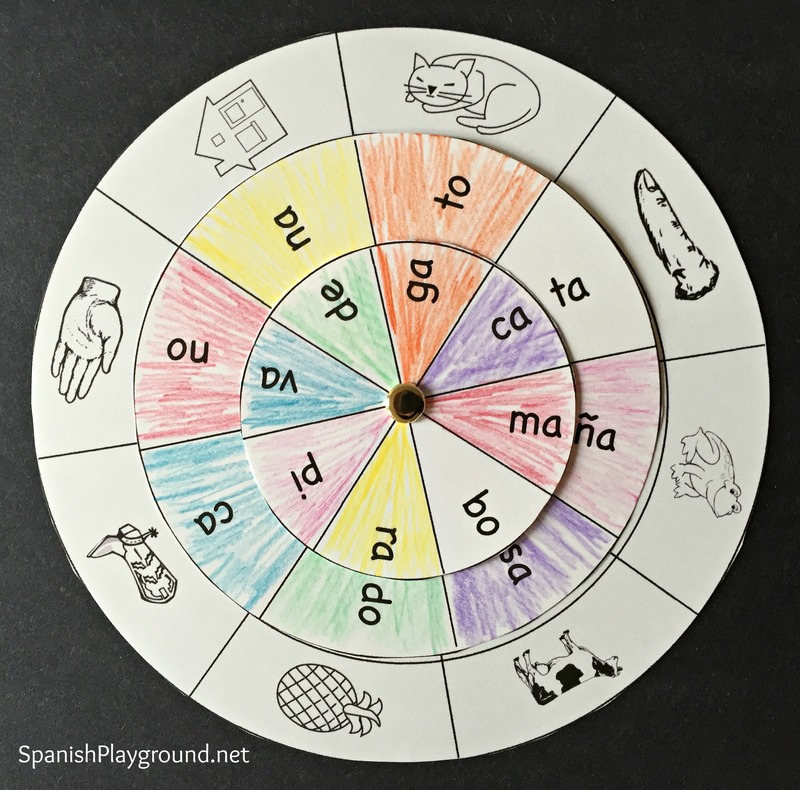 Use the wheel to practice verbs like veo, hay, and es. Kids make a word and say the sentence. Leave off the picture wheel and kids can make different words. This is good for native speakers and kids with more spanish. You can make many words with the two inner wheels such as: gano,gana, gata, masa, caca, pica, pino, pido, boca, bono, boto, ect. If kids are forming other words with the two smaller wheels, you can make a blank large wheel for them to add pictures or sentences. (In groups of mixed levels, I just turn the big wheel over). 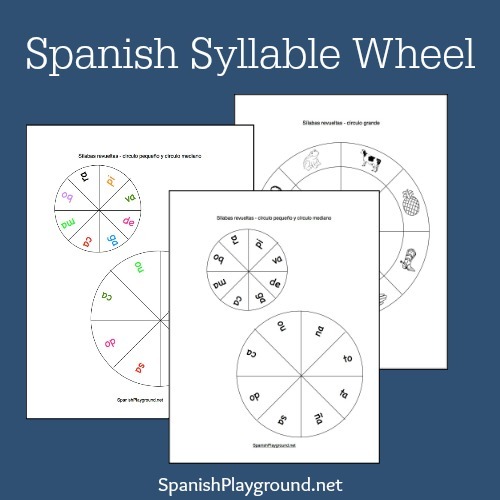 This wheel with Spanish syllables can be used in many different ways. I am sure that you and the kids will think of others. Let us know what you come up with! Me encanta esto para practicar silabas! Tiene usted una copia para palabras con 3 a 4 silabas? Se hace muy complicado usar ruedas con palabras de 3 y 4 sílabas porque hay tantas combinaciones que forman palabras. Hay que buscar otra manera de hacerlo, a lo mejor con un flipbook. Me sería muy útil también. Lo voy a pensar. Buenisimo, muchisimas gracias por compartir!